Only four icons have survived from the Feasts tier of an iconostasis of an unknown church whose name has been lost in the troubled years of the Soviet regime. The war on religion reached its peak in the early 1930s. Out of the 100,000 churches that existed in Russia, 95 % were destroyed or converted for other purposes by the Soviet authorities. 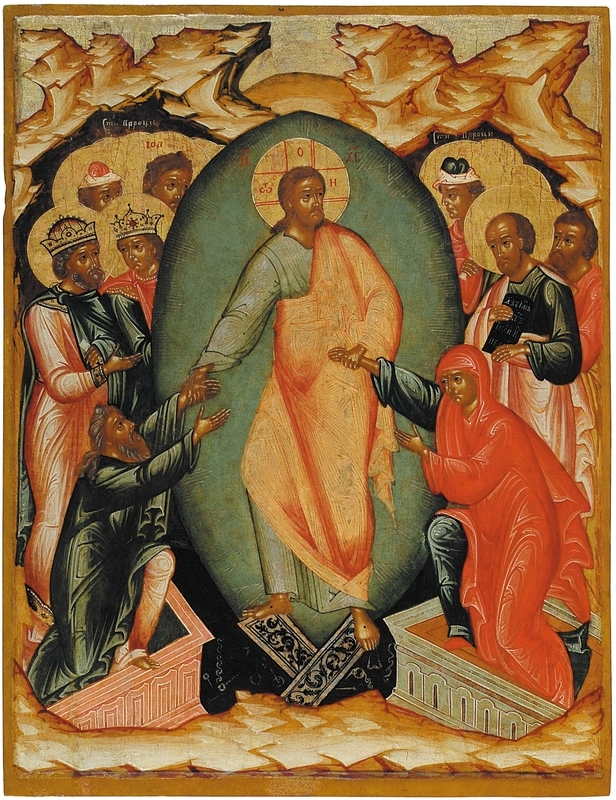 The icons that remain were kept in the storerooms of the Yaroslavl Restoration Committee and later the Yaroslavl Art Museum until it became possible to restore them and publicly exhibit them. This icon depicts Christ riding into the city of Jerusalem on the back of a donkey. The hooves of the donkey do not touch the ground but seem to float above the earth, inferring a divine quality to its rider and presaging his fate. City-dwellers greet him with green branches, while a child spreads his garments on the ground to honor him. This holiday is celebrated on the Sunday before Easter and is known to the Western world as Palm Sunday. In Russia, this holiday is called Willow Sunday, as Russia has no palm trees. Through a striking color scheme, this icon recounts the gospel story of the transfiguration of Christ on Mount Tabor. The compositional focus is Christ’s white and glistening raiment emanating rays of divine glory. A blazing cruciform halo with three arms around the head of Christ contains the traditional inscription in Greek meaning “I am.” Next to Christ are Moses and the Prophet Elijah, and at the bottom of the icon are Christ’s disciples, Peter, John, and James. As reflected by their twisted postures, they are awed by the sight of the transfigured Christ. The star of Bethlehem, at the top center of the icon, shines its light on the scene of the Nativity of Christ. The Mother of God sits before her child. The Magi bring their gifts to the newborn, while the shepherd and the angels sing praises. Only Joseph is troubled and despondent. His dark cave is a symbol of his confusion about the child’s paternity. This icon is infused with patches of bright red to create a dramatic atmosphere. This icon, sometimes referred to as the Resurrection, depicts Christ trampling the wreckage of the Gates of Hell to rescue Adam and Eve. Christ raises them from their coffins and leads them out of a dark cave. Adam is wearing green as a symbol of hope; Eve is dressed in red as a symbol of the future incarnation of Christ through Mary. Behind them are the Old Testament prophets and forefathers. Christ is encircled by a halo of divine glory. The Entry of Our Lord into Jerusalem, from the Feasts tier, ca. 1670. Tempera on wooden panel. 73.6 x 60 x 4 cm. Yaroslavl Art Museum, Yaroslavl, Russia. The Transfiguration, from the Feasts tier, ca. 1670. Tempera on wooden panel. 73.9 x 60.2 x 4 cm. Yaroslavl Art Museum, Yaroslavl, Russia. The Nativity of Jesus Christ, from the Feasts tier, ca. 1670. Tempera on wooden panel. 73.6 x 59.8 x 3.8 cm. Yaroslavl Art Museum, Yaroslavl, Russia. The Descent into Hell, ca. 1670. Tempera on wooden panel. 75 x 58 cm. Yaroslavl Art Museum, Yaroslavl, Russia.